This "manly" looking tackle box is great for a manacle, study, or boy's room. Great quality. I love the contrast between the wood and the matte aluminum. Store your personal belongings and add an antique touch to your home with this box. 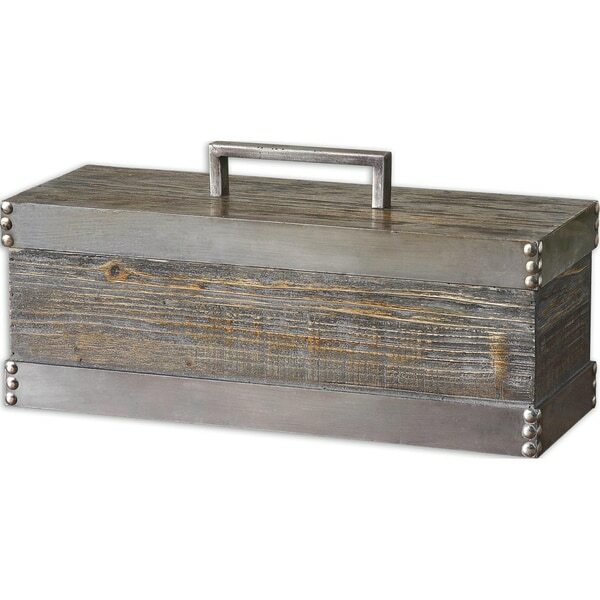 A distressed silver finish and removable lid complete this box. I really like adding old, rustic, ..but unique pieces in my home decor and this box fits the bill in all regards. It's a very substantial box and is actually much bigger than it looked likeit would be, so check the measurements for placement. I have it sitting up as display in built in book shelves and it looks like a very expensive piece and I'm thrilled with it. I had planned to use it to hold remotes .and such inthe family room. But it's kind of a pain in opening it everytime and is too large to sit out in that way. Love anything Uttermost. Looks expensive. I really like this box. It has a genuine look to it. The only complaint would be the way it closes. It has no hinge and the frame around the top is a loose fit. "What are the materials that make up this box and approximately how heavy is it?"